I have this tea set that I 'think' first belonged to my great grandma who was born in 1869. The family story is that she used to buy a piece to add to the set whenever the man selling it came to the village. (in Cumbria, UK). Who knows how much of it is true... but it has been in the family a long time. I'd never thought to even look at the marks on it until I got interested in (and buying) Polish blue and white pottery recently and then my interest spread to the things I've owned for years without thinking about. I've looked online and 'suspect' as the set has various letter marks with a common numerical mark that what I might have is a series of painters marks and a pattern mark. 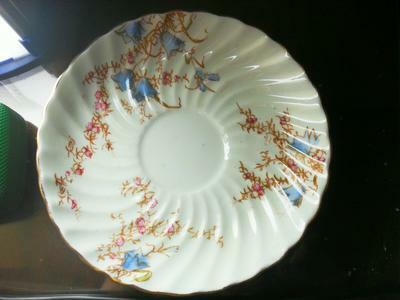 Beyond that I'm stuck... the information might be out there as to what make of china/porcelain this is and I suspect what it might need is a broader knowledge of china beyond marks to be able to recognise a factory or makers style or quirk... the handles are very pretty in shape. The set looks like it has splodges of coloured glaze and then is over painted with gold paint (gilt? )to make the pattern which looks like harebells and possibly heather. Where the pattern is densest you can actually feel it in relief. I have no desire to know what it's worth as it's destined to go to my daughter- I'd just love to know more about it's history and how it ties into my families timeline. I went through the whole set today and some things have marks but many have nothing... the only items to all have writing on are the saucers. A/G 25 - then two vertical lines and a full stop.